The WRC research programme covers a wide range of water-related issues with strong ties to the water research actors and utilities in South Africa and neighbouring countries. Recently WRC has expanded their activities to increase the impact of their research. This is very much in line with the Watershare concept: translating research to action. 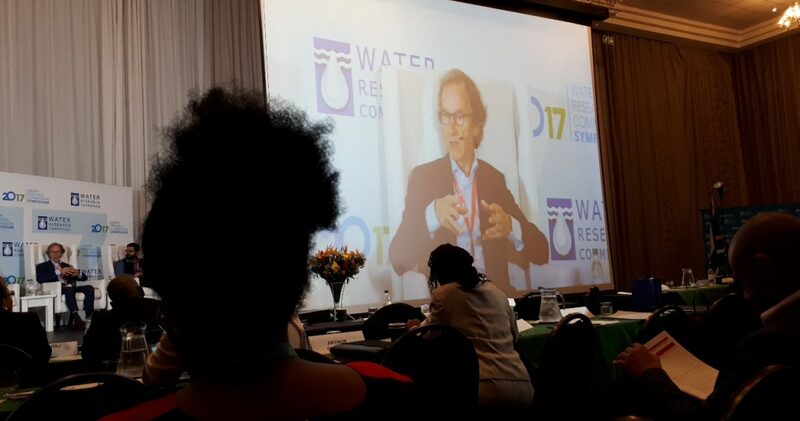 WRC therefore is a strong promotor of Watershare, which became apparent at the various meetings, including a ministerial keynote address during the symposium. The symposium, organized by WRC every two years, counted about 400 participants and clearly showed the pivotal and intermediary role of WRC in the valorisation process, from idea to application and impact in practice. 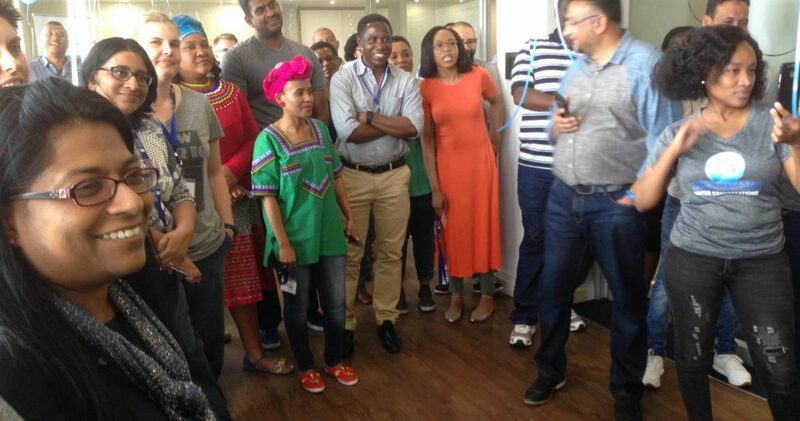 Lead host Valerie Naidoo and WRC staff energizing for the Symposium. The panel session at the symposium stressed the importance of international connectivity in addressing the globally common challenges of the water sector. Watershare was several times mentioned as an instrument to support international cooperation. Theo van den Hoven, representing Watershare at the panel session. During the Annual Meeting on Sunday 17 September at the WRC premises, and a subsequent dedicated Watershare session on Monday 18 September at the WRC symposium, Watershare members made progress reports and discussed opportunities for further collaboration with a focus on the South African research community. The beating heart of Watershare are the five Communities of Practices. Apart from sharing knowledge and developing tools, the CoPs are increasingly engaged in the set up and execution of joint projects to launch and validate the tools. The table below shows examples of these so-called application references. The CoPs will meet at the Amsterdam International Water Week early November to further develop and fine-tune their activities on tools and application references. Dai Simazaki, representing JWRC, contributes to the Watershare session at the symposium. 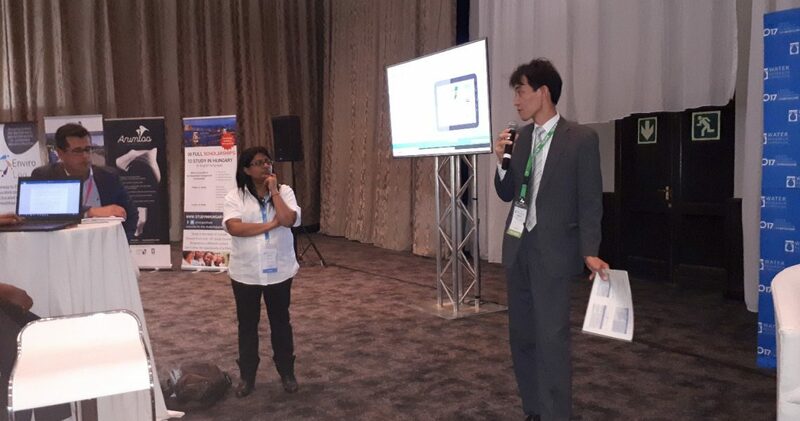 During the sessions, special attention was paid to the newly developed suit of tools for resilience assessment. Worldwide, there is a pressing need for the water sector to stress-test their physical water system and mode of operation against future challenges. Driven by Watershare member NTUA (Athens), a suite of tools is available to quantitatively describe future scenarios and assess the performance of different response options. Application of the tools to a number of water supply systems proves their usefulness for decision-making in multi-stakeholder environments. Christos Makropoulos (NTUA) presents the Resilience Assessment toolbox at the Watershare Annual Meeting. 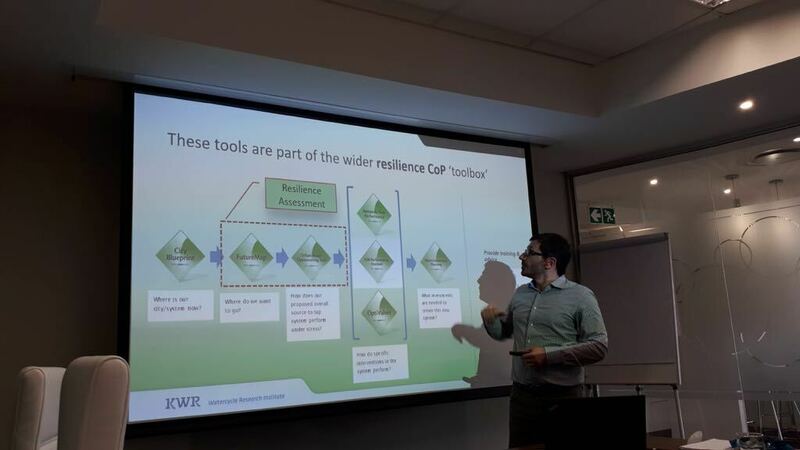 Watershare members agreed to further develop and apply the resilience toolbox, thereby also strengthening the cooperation with the WRC research programme through the engagement of the University of Cape Town. Other priority topics for tool development and application references discussed at the meetings included risk assessment and risk management, asset management and subsurface water solutions. JWRC (Japan) underlined the need for these knowledge and tools, and provided already useful suggestions for further development. The CoPs will take these suggestions on board. 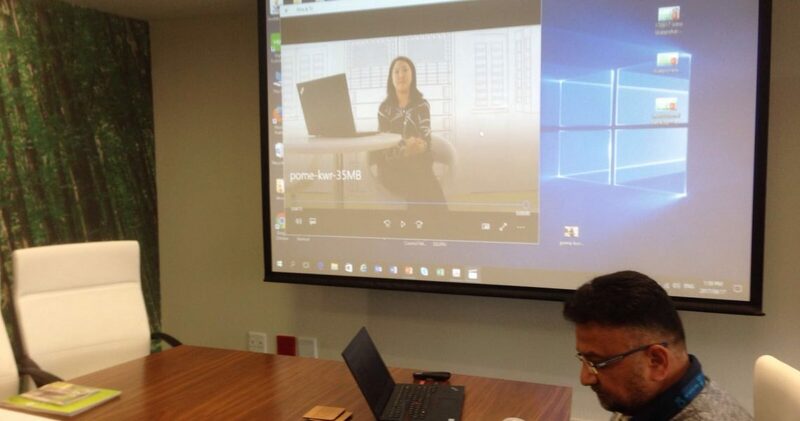 Video message by Bo Wang from new Watershare member Pome Technologies.